We are using Paypal secure payment. Click here to check is paypal available in your country. An example of how to set up the Internet transfer. Call us upon your payment to confirm your transaction. Remember to fax or email to us your transfer referance number. 1. We do not charge GST. 2. Delivery charges will be calculated base on mode of transport. 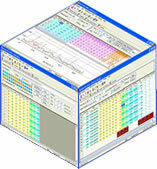 WinTOTO Advance is an advance TOTO analysis software that run in Windows enviroment. WinTOTO has an easy-to-use and intuitive interface. To aid you in navigating around the WinTOTO Advance screen, tool tips appear when you move your cursor near a button, which gives you the name of that tool. Basically, WinTOTO is comprised of the Analysis and the wheeling tools. With all the statistic table, chart and graph, you will be guided with a better understanding of how TOTO really behave. After you have selected the group of numbers to play, you can use WinTOTO full wheeler to wheel and filter out the lower chances number away, resulting a lower investment with higher returns. To make sure you get the latest draw result as soon as possible, our system will update the result within about 1 hour from the draw time. With just a click from the program, you get updated information and start analyzing as soon as possible. There isn't any installation media for ordering online. Once we received your payment, we will prepare a download link for you to download. To know more, you can call our hotline 92300837 for enquiry. Click here for the full features. Renewal of 2 Years Annual Maintenace Support for WinTOTO software from the date of your expiry. This renewal allow you to enjoy 2 years of new upgrade through internet download from our support webpage. Renewal of 1 Year Annual Maintenace Support for WinTOTO software from the date of your expiry. This renewal allow you to enjoy 1 year of new upgrade through internet download from our support webpage. A very comprehensive Lotto statistic software suitable for Android Handphone and Android Tablet devices. Please go to Google Play Store to download with your device. This is a Lotto / TOTO wheeler program. It wheel your selected numbers according to a pre-defined placement of each number that is defined in a template file. This template file can be a user define or the template provided within the program. There are more than 1700 templates available in this package. You can select from System 4 to System 9. Key numbers from 0 key to 3 key numbers. You can play as many as 55 numbers of your choice. The template provided are defined as abbreviated wheel pattern to optimize your play. Mark the bet slip directly from your personal ink jet printer after wheeling. You can define each bet slip configuration for each different printer. Or you can also define each bet slip configuration for each different game. There is also a wintoto pick to help you to pick the numbers if you cannot decide yourself the numbers to play. Download this full working version NOW! You have 15 days to try out all the wonderful features in this program.